The specialty chemicals arena has indeed witnessed a sporadic rundown of sorts in the recent years. Chlorinated paraffin industry, one of the most pivotal verticals of this dynamic business space, has chronicled its name among the many sub-spheres of the specialty chemicals market that have experienced a constant ebb and flow lately. Nonetheless, the chemical domain, in all its regalia, is more representative of the profitable end of the spectrum, pertaining to the many applications of chemical products. Quite overtly, the diversified scope of complex chemical compounds across myriad end-use domains has also been considerably impacting chlorinated paraffin industry share. This complex chemical substance boasts of a widespread application range, right from lubricants and metalworking fluids to flame retardants and plastic additives. Despite the fact that chlorinated paraffin uses are being supervised by strict norms, this vertical is still expected to chart out a lucrative growth path in the ensuing years. In fact, regulations imposed by authorized government bodies have only served to impel chlorinated paraffin industry share. Say for instance, regulations such as CFPA, NFPA 220, NFPA 255, and NFPA 703 implemented with regards to fire safety have significantly propelled the regional industry space. The deployment of these regulations also validates the appropriate uses of chlorinated paraffin as a flame retardant, thereby reinforcing the massive application spectrum of this chemical substance. Chlorinated paraffin encompasses a host of benefits, including the likes of chemical resistance, flame resistance, low-temperature flexibility, and plastic viscosity stability, on the grounds of which it is being increasingly preferred over conventional plasticizers and lubricants by the metalworking, plastic, and consumer electronics companies. Speaking about its flame-retardant characteristics, the uses of chlorinated paraffin in sealants, adhesives, rubber, fabric, and industrial coatings, where the fire resistance aspect is particularly significant, deserve a special mention. Pertaining to the same, most of the leading furniture manufacturers are giving preference for CP as a flame-retardant additive. The growing number of chlorinated paraffin uses in numerous end-user sectors including electronic appliances, paint & coatings, and building & construction will thus push chlorinated paraffin market size to great heights. 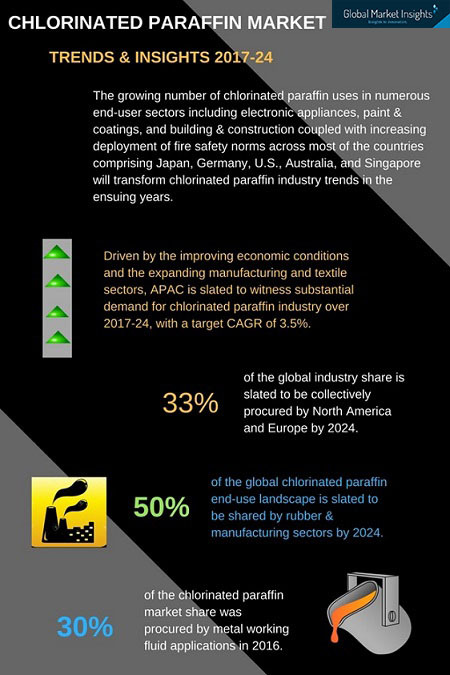 In addition, increasing deployment of fire safety norms across most of the countries comprising Japan, Germany, U.S., Australia, and Singapore, may also act as a key driving force to transform chlorinated paraffin industry trends in the ensuing years. It is prudent to mention that numerous regional governments across the world have been under intense pressure for a long while regarding the industrial uses of chlorinated paraffin. That is to say, government authorities have long since been aware of the hazardous impact of chemical compounds on living organisms, on the grounds of which they have lately been looking forward to examining the risks associated with various chemicals and stringently governing their deployment. It comes as no surprise however, that chlorinated paraffin uses are also being strictly monitored. For instance, 70 years post the introduction of short-chain chlorinated paraffins, the U.S. EPA (Environmental Protection Agency) has undertaken initiatives to scrutinize metalworking fluids, pertaining to the risk they pose to the environment and wildlife. As per the EPA, short-chain chlorinated paraffins possess the capability to kill small aquatic creatures, on the grounds of which numerous metalworking companies have been focusing on conducting research and development programs. Essentially, these R&D programs focus on detecting alternatives for chlorinated paraffin lubricants, which are principally used for various types of metal operations such as cold heading, deep drawing, stamping, tube bending, and honing. The research projects apparently, also concentrate on looking for non-VOC lubricants with regards to environmental safety, since currently, more than 50% of chlorinated paraffin lubricants used as metalworking fluids are petroleum based. At present, B&B Specialties, the California-based manufacturer of military, commercial, and aerospace purpose fasteners, is extensively using petroleum-based chlorinated paraffin lubricants for cold heading operations. However, in deference to the investigation related to alternative lubricants, IRTA has tested the performance of alternative polymer lubricants and detected that they cost much lesser to manufacture. This discovery may potentially hamper chlorinated paraffin market share, according to experts. However, in another instance, Metalite Manufacturing Company, one of the reputed manufacturers of metal products, has decided to continue the usage of chlorinated paraffin lubricants after the successful testing of alternative lubricants for metal working operations. The IRTA also found that alternative lubricants costs 62% more than chlorinated paraffin lubricants. The scenario paints a vivid picture of the current developments with regards to the usage of chlorinated paraffin lubricants. As observed, the preference of metalworking industries for petroleum-based chlorinated paraffin lubricants has been on a fluctuating graph lately. It is rather overt that premature tool wear due to less effective cooling agent results not only in a rise in tooling costs but also in an increase in operation time with higher scrapping rate. Though the use of chlorinated paraffin disturbs the environment and human health, most of the metalworking industries are significantly preferring chlorinated paraffin as a machining fluid, impacting the tool life and associated costs. In this regard, several electronics equipment manufacturers have been attempting to set standards for the threshold limit over the usage of hazardous chemical compounds in various electronics products. One of the leading consumer electronics companies that has been working hard toward this goal is Samsung. The firm has apparently framed few standards on usage of substances in electronics products in order to comply with the suitable directives regarding product manufacturing. The company also plans to use those chemical compounds in a specific quantity to maintain characteristics, quality, and performance of product. The shifting focus of companies toward limiting the usage of hazardous chemical compounds in the products is slated to have quite a tumultuous impact on chlorinated paraffin industry trends. At present, Asia Pacific is touted to be one of profitable growth grounds for the entire chemical space. By extension, APAC chlorinated paraffin industry has been forecast to register an annual growth rate of more than 3.5% over 2017-2024, driven by the presence of several chemical companies in India, China, Japan, and Thailand. India specifically, is one of the most prominent avenues for the growth of this business space, given that the chemical business in the region falls among one of oldest industrial sectors. For the record, India’s chemical industry ranks 6th in the world and 3rd in Asia after China and Japan. It has been observed that in India, chlorinated paraffin wax is majorly used as a secondary plasticizer for manufacturing PVC products, owing to its notable properties such as high resin compatibility, high fire-retardant capability, absence of odor, and excellent heat & light stability. The growing demand for chlorinated paraffin wax for manufacturing flexible PVC has been projected to inherently boost India chlorinated paraffin market outlook over the coming years. Pertaining to the same, chlorinated paraffin wax manufacturers in India are expected to experience quite an affluent period, given that the product is extensively deployed across myriad end-use domains. Not to mention, considering the robust expansion of the regional chemical space, numerous preeminent companies have been working toward expanding their scope across the sub-continent, that will further encourage chlorinated paraffin wax manufacturers in India. Speaking of which, Kanoria Chemicals & Industries Ltd., Sigachi Chloro-Chemicals Pvt. Ltd., PCL Oil & Solvents Ltd., Devi Organics Pvt. Ltd., Kedia Chemical Industries Ltd., and Makwell Plastisizers Private Limited are some of the notable chlorinated paraffin wax manufacturers in India, that have been visibly working toward impelling the revenue graph of this business vertical. Considering that several grades of chlorinated paraffin have been perpetually banned, renowned behemoths in chlorinated paraffin market are looking forward to developing biodegradable CP lately. For instance, Dover Chemical, one of the prominent CP producers based in North America, has been continually involved in R&D programs to come up with a range of eco-friendly chlorinated paraffins that would offer benefits such as ease of disposal, endurance to chloride, and resistance to corrosion. At present, Dover has developed countable ranges of CP products for steel to carry out the metal removing and forming process. It is imperative to state that while the production of biodegradable CP is indeed welcome, its high cost stands as one of the major constraints for chlorinated paraffin industry. Exorbitant expenses notwithstanding, chemical companies have been unrestrainedly attempting to bring forth a CP product range free of harmful substances. Efforts apparently, are also being undertaken with regards to reducing the costs of the innovative CP products. Regardless of the regulatory frame of reference and the usage of alternatives over primary products, the growth graph of chlorinated paraffin market has still been depicting an ascent, owing to the product’s extensive use as an additive – specifically long-chain chlorinated paraffins for textiles, plastics, adhesives, rubber, and paints & coatings. According to Global Market Insights, Inc., chlorinated paraffin industry size has been forecast to generate a revenue of more than USD 2 billion by the end of 2024, driven by its moderately vast application spectrum and the far-reaching scope of product grades available across this business space.